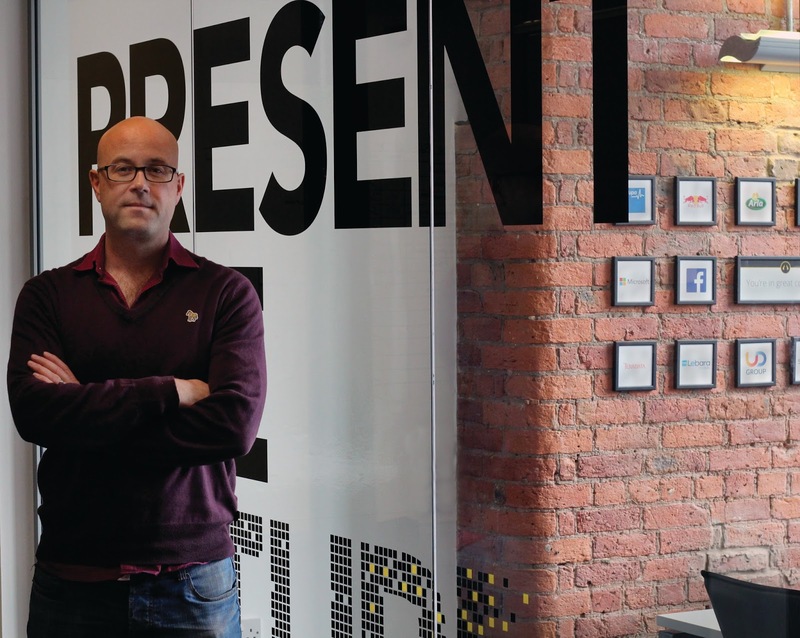 Do you think your presentations are brilliant? Do you carefully craft your content into a powerful narrative and labour over every PowerPoint design decision? Then you probably share a frustration that after all that time and effort spent perfecting a deck, its audience is limited to those in the room at the time of delivery. With all the visual content and social sharing tools available, it’s now easier than ever to get your slides working harder to disseminate your message. 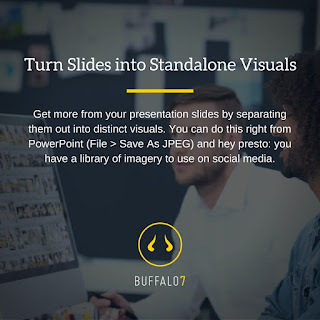 The experts at PowerPoint design agency Buffalo7 have put together 3 key social media sharing tips for getting a higher ROI from your presentations. 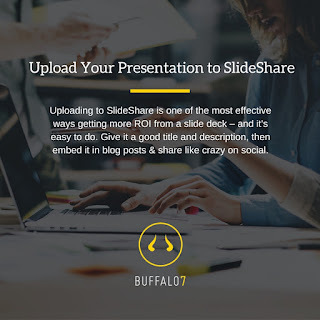 SlideShare is a free presentation hosting service that’s used frequently in the business community for sharing knowledge and insights – being especially popular among marketing and communications professionals. To get started, simply sign up for an account and hit the Upload button. 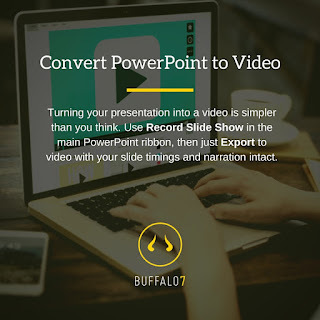 You can then select presentation files from your computer for publishing on SlideShare. Once your presentation’s loaded on, write an attention-grabbing, SEO-friendly title and description, then tag it with the appropriate subject categories to aid discoverability. 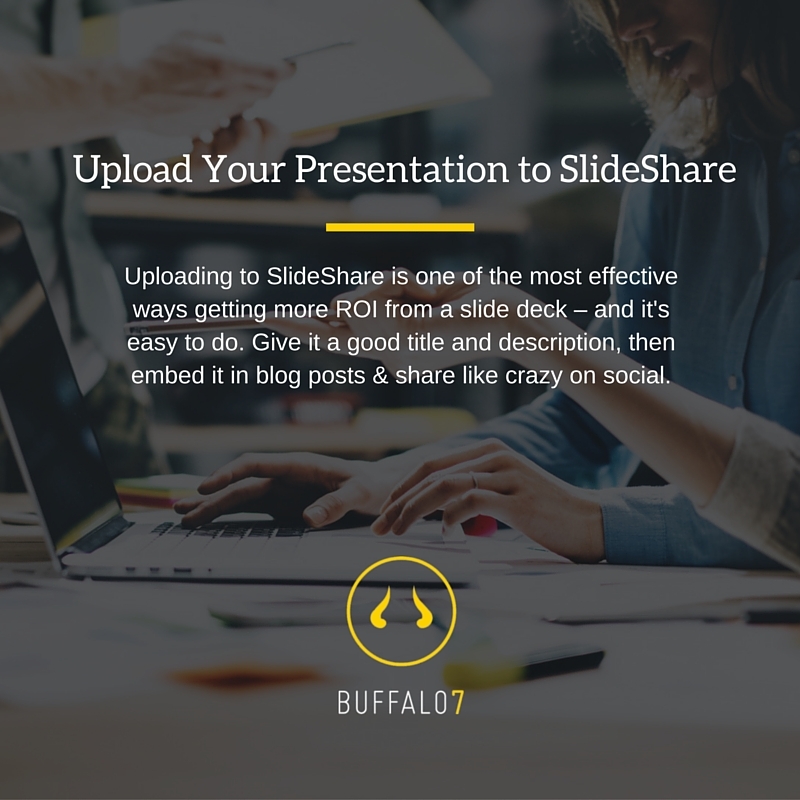 With your presentation hosted on SlideShare, you can easily include it in blog posts using the HTML embed code and share it like crazy on your social channels with just a URL. Bear in mind that SlideShare is best suited to 4:3 resolution presentations (16:9 decks will suffer some cropping). If your presentation contains custom fonts, it’s also a good idea to save it as a PDF before uploading to make sure styles are preserved during the conversion process. This might not have occurred to you straight away, but each slide in your deck is an individual visual asset that is useful in your greater communication efforts. Probably not every slide in your presentation will work as a distinct image, but hopefully there’s a significant amount of slickly designed slides in your deck that contain complete, concise messages. And converting your slides to individual images is easy! Just go to File > Save As in PowerPoint then select JPEG as the file format and confirm that you wish to export All Slides. With your slides separated out this way, you can choose the most appropriate ones and post them on social media to drive traffic back to your blog or website. And take advantage of more specialised channels like Instagram and Pinterest, which are focused on visual content. Don’t panic – this one is easier than you think. Video is now the go-to source of information for many business professionals, making it a perfect medium for sharing your presentation. It’s a great way of increasing engagement and keeping the conversation going around your topic. If your presentation has a strong design with smooth animations and transitions, it’ll likely become a powerful video asset. 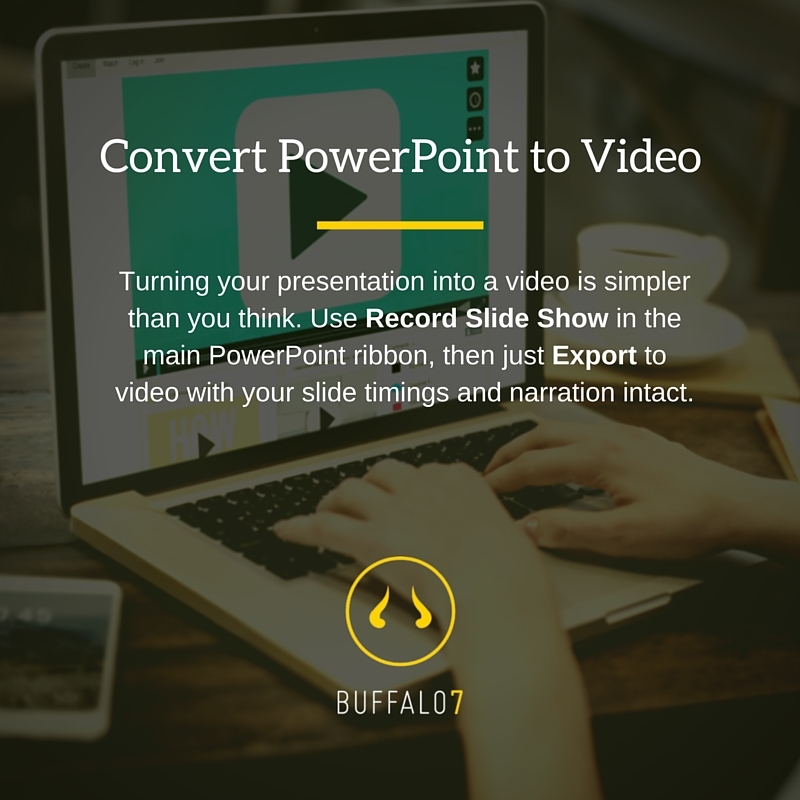 And the best part is that you can export your presentation as a video directly from the main PowerPoint window. To turn your PowerPoint presentation into a video, first record the timing of transitions and narrate your content as necessary. Accomplish this by plugging in a microphone and selecting Record Slide Show from the Slide Show tab in the main ribbon. Select Start Recording from Beginning and ensure that appropriate options are selected for recording slide timings and narration. Then simply guide through your presentation as you would if delivering it to a face-to-face audience: talk around each slide and move at a natural, appropriate pace. Once you’re finished, head to File > Export > Create a Video and Use Recorded Timings and Narrations that you just set. Once the video’s exported successfully, upload it to YouTube and Facebook, write a search-friendly title and description, and start sharing it across social. As with SlideShare, YouTube videos can be embedded with ease: the HTML code for this is located under the video’s Share options. 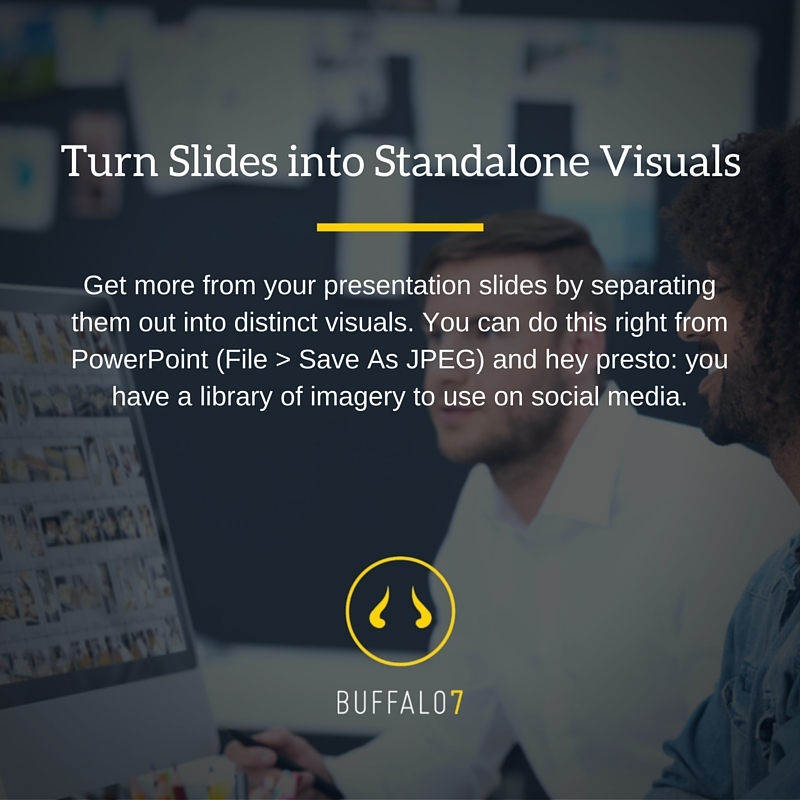 Buffalo7 is the UK’s leading PowerPoint design agency, creating premium presentations for some of the world’s premier brands. 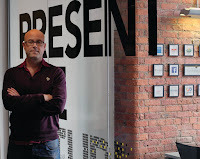 Its recent clients include Sony PlayStation, the Guardian, Unilever, and UEFA Champions League.